I had the pleasure of interviewing 40W member artist Sean Conway for his work in the Sci-Fi Fall Arts Harvest show in November of 2013. Sean’s work for the show was beautifully interpretive and abstract, and asked the viewer to ponder personal ideas about space, symmetry, and a sense of the unknown. Sean expounds on his work in more detail below. 1. CAN you give us a history of yourself as an artist? Who are your major influences? What mediums have you worked in and what are your favorites? 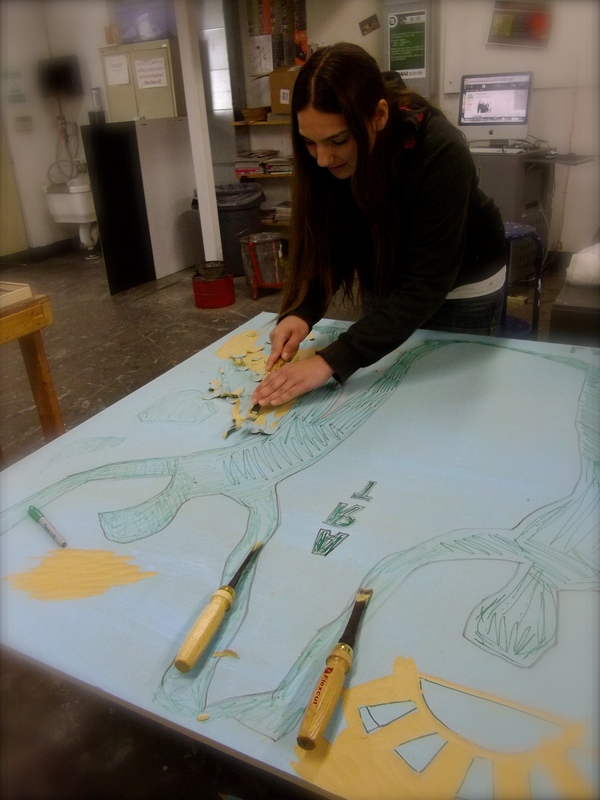 I received my bachelors of Fine Art with a concentration in printmaking from Colorado State University in 2009. My biggest influences have been the other artists that I have been lucky enough to make art with over the years. 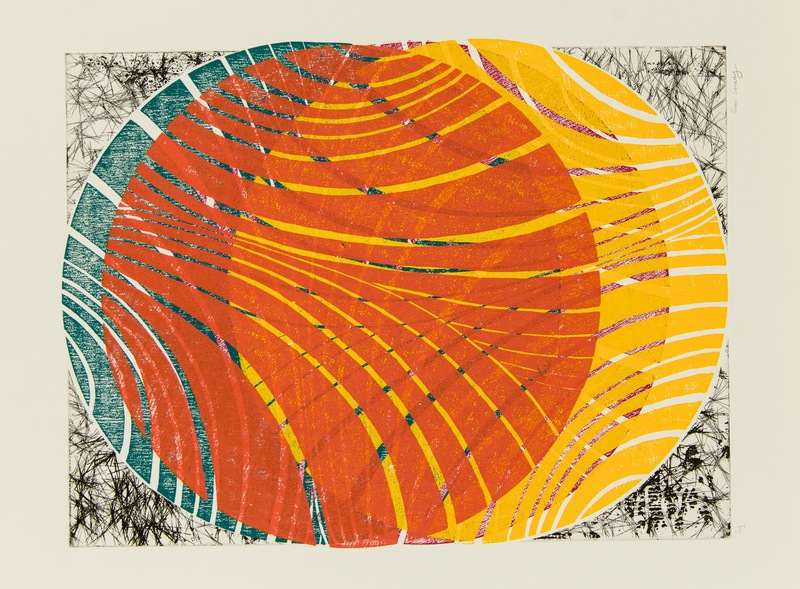 Printmaking (lithography, intaglio, woodblock cut, monotype) is the medium that I work in most of the time. 2. YOUR works have a feeling of both excitement and energy but also this sense of deep calm, perhaps because of your use of circles and symmetry throughout each piece. Are you consciously trying to create a mood with your art? Does each piece have a feeling behind it or something you are specifically trying to convey? I am very interested in creating layered atmospheres and textures, doing so in a finite space with finite shapes, but in a way that is boundless. In these works in particular, circles and symmetry help to create the infinite contained within the finite. 3. IN the painting Untitled 1 (orange, yellow), there’s a strong use of primary colors (red/orange on top of yellow on top of blue). Is this intentional and if so, why? How do such strong color choices convey your message? As I do in much of my work, I used the same matrix various times printed in different colors to create this work. The repetition of the same shape with the same texture as well as the symmetrical composition rely on the strong distinct colors to give the piece the energy I was looking for. The primary colors, when used all together, are inherently forceful while remaining balanced. 3. IN the work Untitled 2 (green, black) it reminds me of molecules coming together or perhaps galaxies in a universe. Can you tell us what were you thinking of when you created this work? What do you want the viewer to notice? Many of my works are inspired by imagining what the universe looks like from the outside. I like to make forms that could be either cosmically enormous or molecularly small. With this work I wanted to be looking right at the middle of everything, and I wanted everything to seem gigantic and tiny at the same time. 4. DO you map out all of your pieces beforehand or is part of the process to just allow the piece to unfold as you are creating it? With many pieces I have a general idea of the composition that I want before I start printing, some times the piece does not change in the process, but most of the time it does. The things that change most often in the process are the colors and slight changes in positioning of the matrixes. Many times I will print a layer and then react to how the color printed before I mix the colors for the next layer, or I will decide to use a different matrix than originally planned on. If I am satisfied with a piece I stop printing, and if I am not satisfied I keep printing on it until I am satisfied, or until I ruin the piece. 5. CIRCULAR images seem to take center stage in your work. Is there something you like about the circle in general, something it represents for you? Circles to me are an impossible shape. It is so perfect in that it connects with itself and is symmetrical, but in reality absolutely perfect circles don’t seem to exist. Since π is a seemingly infinite number, it makes me wonder if it can actually ever connect with itself. Even when drawing circles I always want to draw spirals. The universe to me would have to be a circle, an impossible infinite shape. 6. HOW did you become connected to the 40 West Arts District? What is your history with this organization? I found out about 40 West at the opening of the West line light rail. I joined in order to be involved with a local arts organization and connect to the art community in [Lakewood]. This 40W spotlight artist was selected at random. If you are a 40W member artist and have an interest in being featured on this blog, please reach out to Liz Black at elizabethanneblack@yahoo.com. A former painting teacher of mine once told me that artists require three things: talent- which you need little of, practice- which you need tons of, and teaching- which isn’t required but absolutely helps. Classes stimulate our mental senses, break down concepts that can otherwise take years to master, and increase our awareness of artists and the art community. Even better when the class is free. And because I love all things art (and all things free) I’m enthusiastic for the 40W Arts District Studio Sessions, a series of classes taught by Artist in Residence Ryan Mathews and held at varying locations throughout the year. These courses represent one of the many facets of 40W Arts District and highlight our commitment to education, community engagement, and energetic growth with the arts as a catalyst. I attended an inaugural session at Rocky Mountain College of Art + Design and found the class to be delightfully straightforward and hands-on. A creative current charged the air and I noticed a palpable sense of shared accomplishment as artists worked together around the large wooden printmaking board, scraping away negative space and growing the design together. I increased my skills in printmaking (which were zero before this session) and walked away with a little bit of inspiration of my own. The next three sessions are coming up soon so check out details below to mark your calendar. Don’t forget to take a look at pictures from the printmaking class! Click here to learn more about our Artist in Residence program. Click here to find detailed information on upcoming classes.